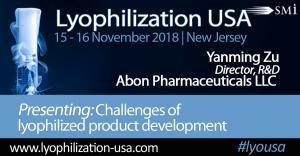 NEW JERSEY , ISELIN, USA, August 14, 2018 /EINPresswire.com/ -- SMi Reports: An exclusive interview with Dr. Yanming Zu, Director at Abon Pharmaceuticals, who will be presenting an Opening Address on 'Challenges of lyophilized product development’, in the run-up to the 4th annual Lyophilization USA Conference taking place 15th-16th November 2018, Iselin, New Jersey, USA. The two-day conference promises to provide a stimulating environment for delegates, with an impressive list of international industry experts from Pfizer, Amgen and Merck sharing their experience and thought-leadership across a full conference programme. SMi Group caught up with Dr. Yanming Zu to talk about her role in the field and her responsibility for the generic and proprietary product development, as a registered pharmacist and her career as a Senior Principle Scientists joining Abon Pharmaceuticals back in 2009. Dr. Zu’s research and development work contributed to a number of ANDA filings and approvals, and generated several patents, research papers, review articles and presentations. Q . What is the greatest challenge to overcome in the field at the moment? A. Poor solubility and instability of new chemical entities are challenges in the field of lyophilisation, especially with the increasing number of the insoluble and unstable drugs." Q. What technology has really caught your eye in the Lyophilization field in the past year? A. Controlled nucleation is one of the most typical trends in the industry, as uncontrolled nucleation introduces significant heterogeneity affecting the product quality, while the controlled nucleation technology allows for improved uniformity, consistence and thus the product quality assurance."